Aside from the vague start location and time it was an excellent tour. Celine the guide was fun and informative. Melissa was great! She knows her stuff and has a wonderful personality and attitude. She obviously loves what she does as it shows in her explanations. Melissa was our tour guide and she was fantastic! Extremely engaging and brought value to this tour. Was great to skip the line into Alzacar and all the information was very well presented. Well worth the money! Tour with guide Melissa was very entertaining and interesting. She knew a lot about places we visited and was able to keep everyone's attention. 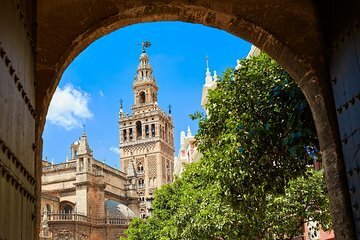 The Cathedral and Alcazar is a definite Must See however We would choose a different tour company if We ever went back. We were told to arrive 15 minutes early for our 10:45AM Tour. Jose Antonio, our guide did Not even show up until 10:45 - the Time we were supposed to leave. It took him another 25 minutes to get himself organized so we did not depart until 11:10AM almost 11:15AM which caused us to miss another event we had planned later the same day! This Guide was very disrespectful of everyone's time especially after the Tour Company expressing that we must be there 15 minutes early! Ce lieu mériterait de passer plus de temps à découvrir. Dommage que la guide Français-espagnol ne fasse pas que la visite en français. Avec le meme temps, on pourrait voir plus de choses et passer plus de temps dans cet endroit magnifique. Embora o guia tenha se mostrado muito competente, algumas coisas ficaram de fora, principalmente na Catedral. Muito tempo perdido em explicações repetidas.